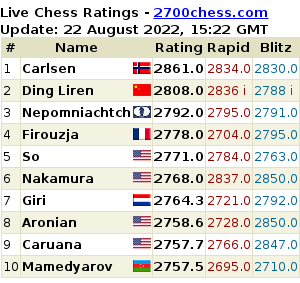 Thus, Fabiano Caruana and Boris Gelfand are tied for the 1st place in the final standings with 6.5 out of 11 each. The prize money as well as the overall Grand Prix standing points are shared equally, irrespective of tie-breaks. Gelfand's round 11 game vs Peter Svidler has been drawn in an equal endgame, but it wasn't exactly the same for Caruana who could have been still tortured by Evgeny Tomashevsky without much risk. At first, the initiative had belonged to Caruana, but a few dubious moves made his position already slightly worse, as can be seen in the diagram. However, after 31.Ra3 the draw was agreed. Alexander Grischuk, Sergey Karjakin, Hikaru Nakamura, Peter Svidler and Evgeny Tomashevsky have finished the tournament with 6 points each (places 3-7). Sergey Karjakin has scored his first victory in the Baku tournament. 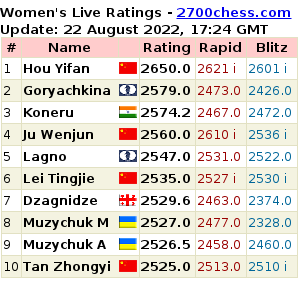 The second tournament of the FIDE Grand Prix series 2014/15 has seen its opening today evening, only a few days since the finish of the Baku battle. Most of the players, including both triumphers, have shifted to the capital of Uzbekistan to continue fighting for the Grand Prix. The newcomers of the series are Anish Giri, Maxime Vachier-Lagrave, Dmitry Jakovenko and Baadur Jobava.